Sixty new architects have been sworn in and added to the standing register of the Architects Registration Council (ARC) after undertaking the Council’s Professional Practice Examination (PPE). The 18th induction ceremony held last Wednesday in Accra at the Ghana Academy of Arts and Sciences was an important national assignment of the ARC. It also climaxed six years of academic qualification at the university, a minimum of two years of post-qualification coaching and apprenticeship under a qualified senior architect, structured seminars and tutorials and finally professional examination, with a minimum pass mark of 60 percent to gain state licence. Cyndelle Araba Kwabi was adjudged the overall best candidate with Dexter Tsatsu Dziekpor and Emefa Ahiable occupying the second and third positions respectively. Registrar of the ARC, Stella N.D. Arthiabah, who swore in the new architects, expressed satisfaction about the Council’s regulation of the profession over the years. She called on government and the private sector to engage local professionals in building and infrastructural matters, as well as in industry-related policy development and implementation programmes, as the industry keeps getting complex with technological innovations which require such expert support to address them. She seized the occasion to re-introduce into the industry the over 900 registered architects aside the 60 new ones ready to be engaged by both government and private sector developing projects. “Our architects possess the skills to maximize efficiency of use of space and enhance work output. Architects are ready with innovative and cost-effective solutions for the district factories, Zongo development programmes and other government projects”. In a solidarity message, President of the Ghana Institute of Architects (GIA), Richard Nii Dadey, urged architects to constantly upgrade themselves to keep abreast with both socio-economic changes and technological developments. 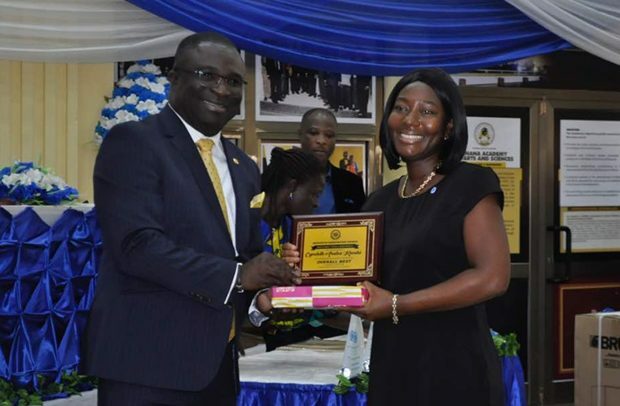 Deputy Minister of Works and Housing, Eugene Boakye Antwi, who represented Samuel Atta Akyea, Sector Minister, as special guest, admitted that the construction industry contributed about 15 percent to the GDP. Yaw Osafo-Maafo, Senior Minister, in his address, made a passionate appeal to the industry to focus on the use of local building materials, explaining that government’s quest for a ‘Ghana Beyond Aid’ could only be achieved through the maximum utilization of the natural resources available in the country. He further urged architects to be proactive in offering the needed assistance to government in order to achieve sustainable cities and communities.